280 grams of corporate colour mini jelly beans packed in double walled stainless steel coloured mug. 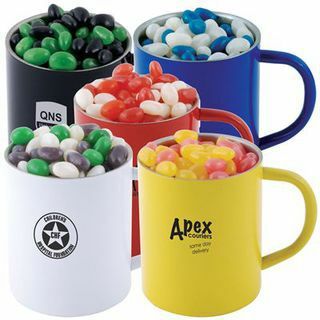 Corporate Colour Mini Jelly Beans shrink wrapped in Double Wall Stainless Steel Coloured Mug. Your choice of jellybeans, choose from 9 great colours and flavours - Orange (Orange), Pink (Raspberry), White (Lychee), Red (Strawberry), Green (Apple), Yellow (Lemon), Black (Grape), Purple (Grape), Blue (Blueberry). Your choice of Black, Blue, Red, White or Yellow mugs.